Faden operation was first described by Cuppers in 1912. Faden means a “suture” in German and the muscle is fixed posteriorly 12–14 mm behind the insertion, thus creating a new insertion. This reduces the moment arm and the force of rotation. The decrease in the force of rotation happens as the eye moves in the direction of the fadened muscle. This is a useful surgery in esotropia with convergence excess, nystagmus blockage syndrome, Duane's retraction syndrome, dissociated vertical deviation, and contralateral medial rectus yoke muscle in case of sixth nerve palsies. In esotropias with increased accommodative convergence ratio, Faden operation with recession significantly reduces the distance near disparity without much change in the distance alignment and the results are similar to those obtained with augmented medial rectus recessions. In esotropic eyes with unilateral poor vision, Faden combined with recession reduces the chances of overcorrection as opposed to a recess resect procedure. When Faden is combined with recession, the weakening effect is more. The conventional Faden is difficult to perform and cumbersome as there is very less operating space medially, and preplaced sutures at the Faden site is 12–14 mm from the insertion, which is too posterior for accessibility. Hence, Faden with recession has become a lesser performed surgery. In this article, we highlight the use of a single double-armed 5-0 polyester suture and a modified technique which makes the surgical procedure much easier. We have performed this modified procedure on the medial rectus muscle which yields the best results due to the shortest arc of contact. Six patients enrolled for this IRB-approved surgical procedure. Only patients with small angle Esotropia (ET) (12 to 25 Prism Dioptre [PD]) who needed one muscle (medial rectus) were included. 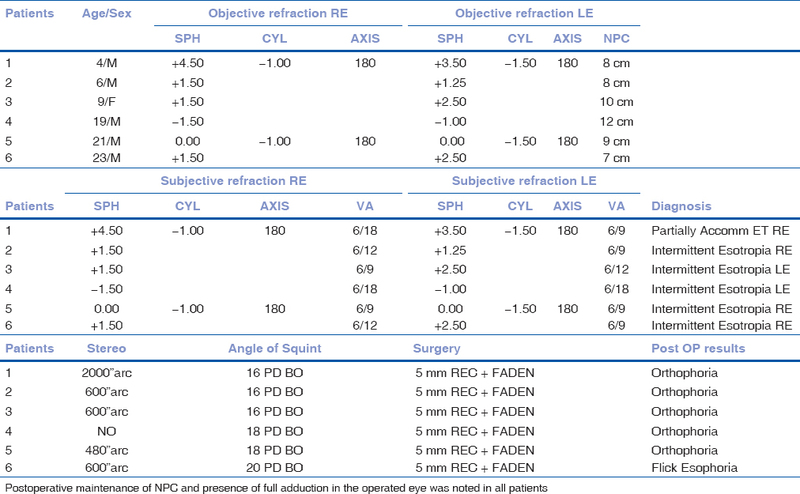 Preoperative evaluation included best corrected visual acuity with glasses measured using Snellen chart, cycloplegic refraction, measurement of angle of squint for both distance and near, near point of convergence (NPC) by Royal Air Force (RAF) ruler, stereopsis using TNO Stereoacuity Test, slitlamp biomicroscopy, and dilated fundus examination. Informed consent was obtained from patient or parents, whichever was applicable. [Figure 1] shows the preoperative deviation and postoperative alignment in a patient with left esotropia of 20 PD. Under general/local anesthesia, medial rectus muscle was secured with a three-point fixation (a central fixation knot followed by locked bites at the two edges of the muscle) using a single double-armed 5-0 polyester suture and then a scleral bite of length 2 mm was taken parallel to the muscle, 5 mm posterior to the insertion, and another bite was taken 12 mm from the muscle insertion on both sides of the muscle. The suture comes back to the muscle at the first scleral bite site (recession site) and is passed through the edge of the muscle inwards incorporating 1/4 of muscle thickness at this site on both sides. The muscle is cut at insertion and the central suture is tied anchoring the muscle posteriorly. Thereby, the muscle is recessed as well as fixed posteriorly at the Faden site by a single double-armed 5-0 polyester suture. Postoperatively, angle of squint for distance and near, NPC, adduction deficit in the operated eye, and stereopsis were assessed at 1, 3, and 6 months. Six patients were operated by the modified Faden operation on the medial rectus muscle. All patients had satisfactory postoperative alignment with maintenance of preoperative NPC (mean 9 cm) postoperatively and presence of full adduction with absent lateral incomitance on the operated side. The details of these patients are presented in [Table 1]. Faden surgery also known as posterior fixation suture surgery is used to weaken the rotational force of a rectus muscle when the eye rotates in the field of action of the fadened muscle. When Faden is performed the basic muscle tone remains the same because the distance between the muscle origin and insertion remains the same. When Faden is combined with a recession, the effect of recession is enhanced without much slackening, which is otherwise observed in large recessions as the slackening is taken up in by the relatively short portion of the muscle between the origin and point of insertion of posterior fixation suture. Faden surgery with or without recession has been done in esotropia with high accommodative convergence ratio, nystagmus blockage syndrome and dissociated vertical deviation, and paretic squints to reduce incomitance and improve the binocular field of vision. Small angle esotropia have been treated with single large muscle recession but has its own disadvantages. It can affect convergence, induce incomitance in side gaze, and there is risk of postoperative exotropia as muscle slackening is more. We performed a “modified Faden operation” combined with recession in a series of patients with small angle ET up to 25 PD, using only one double-armed 5-0 polyester suture, which is a novel and simple technique to perform as opposed to the conventional method. The main issue with Faden is exposure of the surgical field and extensive dissection that is needed. Exposure can be improved by using Desmarres retractor. Further improvement of exposure is by retracting the globe with a muscle hook; however, on combination with recession this is not possible unless locking forceps is used at the muscle insertion after disinsertion. The scleral bites at the Faden site are taken perpendicular to the muscle fibres, and because of the posterior location and poor accessibility there is a risk of scleral perforation. The conventional Faden also requires two sutures for recession and Faden. There are two ways of performing the surgery. One method is by posterior fixation suture with double side stitch and rectus muscle recession. 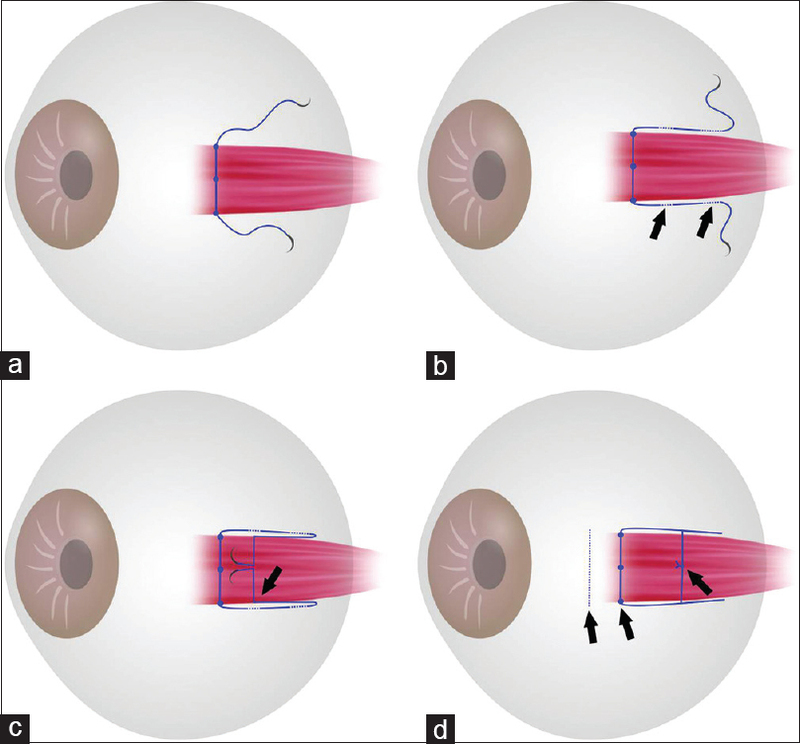 In this procedure, two preplaced scleral bites 2 mm in size are taken first at the proposed Faden site. The recession then proceeds. After recession, 1/4 of the muscle width is incorporated at the Faden site on either side of the muscle and the sutures tied. In this method, encirclage of 1/4 of the muscle on either side at posterior fixation is established. The other method is posterior fixation suture with a single central stitch combined with recession. In this method, after securing the muscle by three-point fixation, the muscle is disinserted for recession and a central 3 mm bite is taken at the sclera on the Faden site as well as at the corresponding site in the muscle (which is the distance of posterior fixation minus the recession), after which the recession is proceeded with and subsequently the central fixation suture is tied at the Faden site. In this method, encirclage is not done at either side. The muscle is fixed posteriorly and adequate anchorage is brought about by the central fixation suture. In our technique [Figure 2], 2-mm bites are taken on the sclera at the recession site and then at the Faden site, both bites are taken parallel to the muscle as opposed to perpendicular bites in the conventional procedure. After the second scleral pass, sutures are brought back into the muscle on either side at the recession site followed by disinsertion of the muscle and then tying the suture knot. The muscle now lies recessed as well as fadened by the appropriate measurement. The tied suture lies at the Faden site and the muscle is anchored to sclera by a central suture. The muscle can be maneuvered as it is hooked and rotated away from the field until the scleral bites are placed at both sites which provides better exposure. Scleral bites at both sites are of 2 mm in length and parallel to the muscle belly which is easier to place than perpendicular bites as in conventional Faden. A single 5-0 double-armed polyester suture would suffice to perform this procedure compared to two sutures and entanglement that can occur with conventional Faden. When Faden is performed there is lesser risk of over correction  It is useful in sixth nerve palsy, unilateral dissociated vertical deviation, and in nystagmus with face turn to augment the recession effect. Bridge Faden with or without recession  has been reported in literature to prevent scarring. In this procedure, no suturing of the muscle is done. Scleral bites are taken on either side of the muscle at the Faden site, and a knot is made on the muscle. In our procedure, bites are taken in to the muscle and then tied down. Scarring is less even with our procedure as the muscle is tied down only by the central suture without the edges being involved but ensuring better posterior fixation. In conclusion, the modified Faden operation as a new surgical technique can be used instead of the conventional surgery for all known indications and can be performed with ease and confidence. Cuppers C. The so called “Faden operation”: Surgical corrections by well-defined changes of the arc of contact. In: Fells P. ed. The 2nd Congress of the International Strabismological Association; P395. Marseilles, France, Diffision Generale de Libraririe; 1976. Kushner BJ. Preslan MW, Morton GV. Treatment of partly accommodative esotropia with a high accommodative convergence-accommodation ratio. Arch Ophthalmol 1987;105:815-8. Elsas FJ, Mays A. Augmenting surgery for sensory esotropia with near/distance disparity with a medial rectus posterior fixation suture. J Pediatr Ophthalmol Strabismus 1996:33:28-30. Nicula C, Funariu I. The Faden operation in strabismus surgery. Oftalmologia 2001;53:31-4. Wang L, Nelson LB. One muscle strabismus surgery. Curr Opin Ophthalmol 2010;21:335-40. Wright KW, Strube Yi Ning J. Faden operation (posterior fixation suture), chapter 20: 200-204; color Atlas of Strabismus surgery, Springer New York. Harcourt B. Faden operation (posterior fixation sutures). Eye (Lond) 1988;2:36-40. Cherednichenko VM, Slyshkova GS, Pastukh IV. Surgical treatment of congenital nystagmus in children. Oftalmol Zh 1989;154-6. Inal A, Ocak OB, Aygit ED, Celik S, Ozturk Karabulut G, Inal B, et al. Medial rectus bridge faden operation in accommodative and partially accommodative esotropia with convergence excess. J Pediatr Ophthalmol Strabismus 2017;54:369-74.